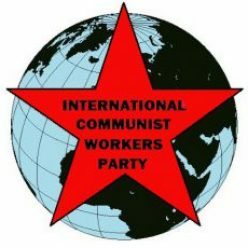 LOS ANGELES (USA) — Several Party comrades attend a liberal church. We are not the only open atheists there. Being communist revolutionaries (not liberal pacifist reformers) is actually a bigger contradiction – especially around elections. Some church friends are interested in our ideas. Others aren’t, but remain friends. The church has a program to “build bridges” with Muslim neighbors. We’ve visited mosques. We’ve helped to organize well-attended formal and informal presentations on Islam. We’ve had public rallies, for example supporting Syrian refugees. We’ve enjoyed many social events at the church, a mosque, and in homes. Usually people talk about their lives and their families. There hasn’t been much talk about religion or politics, except about how to oppose anti-immigrant and anti-Muslim policies and hate crimes. After the election, several Muslim friends wanted to talk about Trump and what to do. Ten of us had dinner at a comrade’s home. They and some of their friends are readier now to get involved in things outside their families, professions and mosques. The comrade gave everyone Red Flag. None of the non-Party friends (from the church or the mosque) seem very interested. But our friendships have become closer and more open. Can we recruit religious people to the Party? Some of the church members are nurses, teachers, computer techs. Others are self-employed professionals. The same is true for most of our Muslim friends. 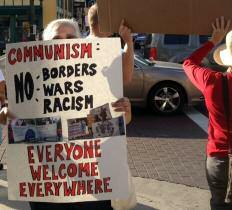 They are part of the broad masses we hope to lead to build communist society. But they are not amongst the industrial workers, soldiers or youth on whom we mainly rely to mobilize masses for communism. Still, one comrade has joined the Party through the church work. We are patient. Others will come. Muslims we meet through “interfaith” activities are often very active in their mosques. They want us to understand their religion. They often correctly see communism as contradictory to their religion. The same is true for others we meet in “interfaith” work. We can talk with them about how aspects of communism mesh with aspects of their religion. But it’s not reasonable or respectful to insist that our party fights for a mass understanding of dialectical materialism and then to tell religious people that they can join anyway. Sure, we want them to join. Of course, we agree on some social issues. But let’s understand that someone’s religion can be central to their world view. It’s not something they can lightly put aside. Religion is an obstacle to mobilizing for communism. Muslim people we meet in secular situations (work, neighborhood, rallies) may be more open to communist ideas. Muslim organizations are allying with immigrant workers and others against capitalism’s racism and fascism. We need a long-term perspective. We must build friendships capable of sustaining political struggle. Recently an atheist friend arrived at an event as the Muslim speaker explained why she believed the Koran rather than the Bible. “She was talking about God and I wondered what I was doing here,” said the friend. But she stayed and came back the next time. “Now I understand where she is coming from,” she admitted. Part of the problem is idealism (belief in non-material entities like God, angels, and jinni). Another is the dogmatic belief that eternal truth comes out of some book. Unfortunately, communists sometimes become dogmatic. Someone says: “Marx (or Lenin or Stalin or Mao) said it, so it must be true.” Sometimes we get stuck on a particular way of saying something and keep repeating it instead of developing the idea further. A big difference between scientific communism and religion is that communists criticize and try to avoid such mistakes. Our knowledge of how communism will work must grow out of the masses’ historical experiences and from practice. We use dialectical materialist philosophy to analyze this practice scientifically. We form hypotheses and test them with collective political work and analyze the results together. The bigger and stronger the collective, the more we learn. That’s why we need a mass party – with you in it!